Mount Waverley, Victoria; November 29, 2017—MotorCycle Cruise Controls (MCCruise), of Australia, has introduced a range of electronic cruise controls for motorcycles and other vehicles operated using throttle-by-wire technology, including automobiles, ATVs, UTVs, and tractors. These fully tested after-market kits are newly available for KTM's 1190 Adventure and 1090 Adventure R, Yamaha's FJ-09™, FZ-09®, XSR900™, and XT1200 Ténéré®, and the Polaris Ace® ATV. MCCruise's new cruise controls draw upon twenty years’ experience in supplying after-market motorcycle cruise controls to the global market. They represent leading-edge software and hardware performance, reliability, diagnostic innovation, and trouble-shooting developments. Only MCCruise kits include a fully waterproof computer module and a backlit switch developed specifically for use with motorcycle gloves. Exclusively protected by global product liability insurance, MCCruise has developed superb diagnostic tools to facilitate remote support and service and provides comprehensive, user-friendly installation instructions. In addition to reducing hand fatigue and improving rider comfort, the benefits of MCCruise electronic cruise control include gentle, smooth transition from manual to cruise settings, optimized fuel consumption, control over safe operating speeds, and avoidance of costly speeding fines. Every MCCruise kit comes with start-to-finish sales and service support and a commitment to total customer satisfaction. Headquartered in Victoria, Australia, Motorcycle Cruise Controls (MCCruise) first designed an electronic cruise control for motorcycles in 1996. Insisting on exacting performance and model-specific custom application, the company's founders, brothers Tony Guymer and Frank Guymer, began expanding their cruise control product line to now include over 150 motorcycle models and manufacturers. They continue to develop products and applications reaching new markets around the world. 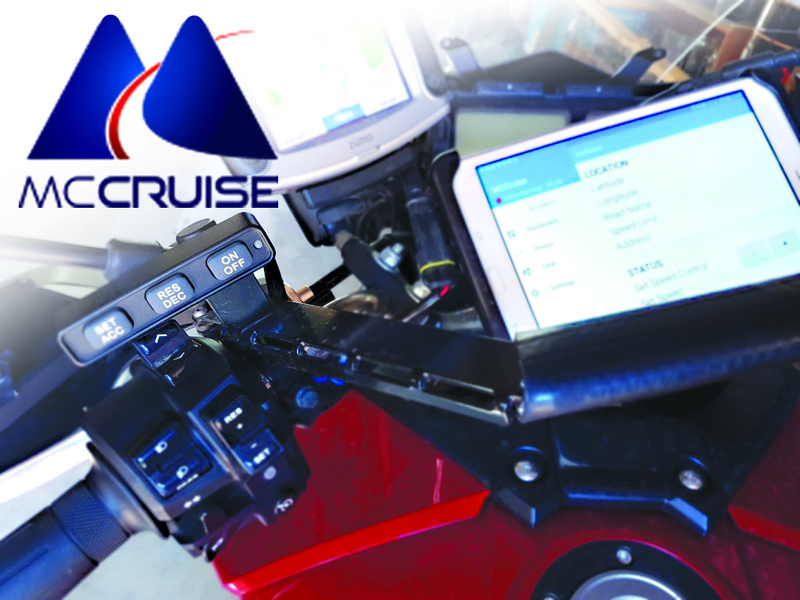 MCCruise has adapted its unique speed control technology for agricultural ATV, UTV (QuadCruise) and tractor use, optimizing resources and protecting crops from over-spraying. MCCruise speed limiters also deliver measurable savings to companies utilizing ATVs in their operations, such as railroads, mining companies, orchards, farms, etc., by reducing risk of operator injury and lowering insurance and vehicle maintenance costs. More information about MotorCycle Cruise Controls, its products, and corporate mission may be found at www.mccruise.com.